Mobile phone manufacturers have really upped their audio game in recent years. 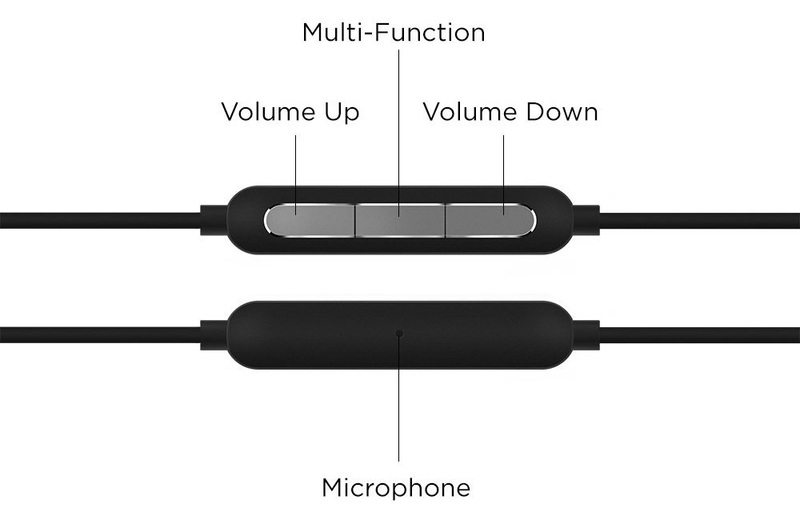 Having high-quality audio via either speakers or headphone/Lightning connector is fast becoming a call-out feature. Samsung's Galaxy S9, for example, has speakers 'tuned' by audio specialists AKG, the Razer Phone carries size-belying speaker heft, while others, such as the LG G6, offer a hifi-class quad digital-to-audio (DAC) convertor. 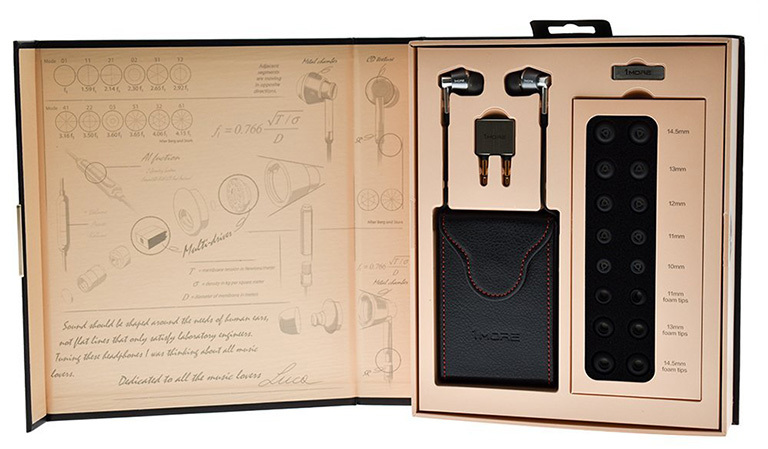 Some even go so far as to bundle in a decent pair of earbuds into the premium package, elevating audio to first-class citizen status. There's an understandable plethora of choice for aftermarket buds, too, from the basic £10 replacements to audiophile-quality offerings costing more than £100, and because audio relies upon subjective perception to a greater degree, knowing what's genuinely good requires a careful look at the technology underpinning a range of buds. This is where a company called 1More likes to think it has an edge. Already widely available in the US, 1More is looking to win over support in Europe, and I have the firm's £80 Triple Driver model in for review today. 1More understands that first impressions count. Presentation is top-notch, with six sets of silicone ear tips of various sizes, a trio of Comply-style foam tips, a shirt clip, a leather carry pouch, and a two-pin adapter for airplane sockets. The buds themselves are available in either silver or gold. Cabling is interesting insofar as the majority of the 1.2m length, from the 3.5mm jack to the splitter, is braided. From there it is solely rubber, which has a greater propensity to get snagged on clothing. Further up, between the splitter and right ear bud, is a multi-function control whose construction doesn't match that of the buds themselves. The plastic controller is simple enough to use, and there's just the right amount of button pressure to know when it has been pressed, but subjectively it's too close to the bud - I'd prefer it another two or three inches further down so that it doesn't occasionally rub on the chin. The microphone, meanwhile, is decent, with clear, crisp audio, and unlike some, there is no need to raise your voice when having a conversation. Being optimised for phones, calls are answered via single tap, songs are paused by the same single tap and skipped onwards by pressing the central button a couple of times. All makes intuitive sense. The buds, meanwhile, is where the technology and money is at. The aluminium construction is excellent and does exude a real feeling of quality. Connection between the rubber cable and bud is solid enough to resist a firm tug while the oversized shape of the bud and off-centre design means it is easy to identify right and left. The extra protrusions on each end make the 1More stick out a little more than normal - you certainly don't want to sleep in them. Having a rotated tip works pretty well as the bulk of the bud rests ergonomically in the ear, and I found them comfortable for extended periods. The seal between bud and drum is nice and plush for me with the already-attached pair, but having an extra eight pairs to choose from ought to mean that there is a good fit for anyone. Though doing a good job in masking outside noise, these buds don't have explicit noise-reduction technology. As the name intimates, these earbuds rock three drivers - two tweeters and one larger dynamic driver tasked with creating the heft for bass. The premise is to enable a cleaner, bigger soundstage by tweaking the frequency curve for each, rather than rely on a single full-range driver. 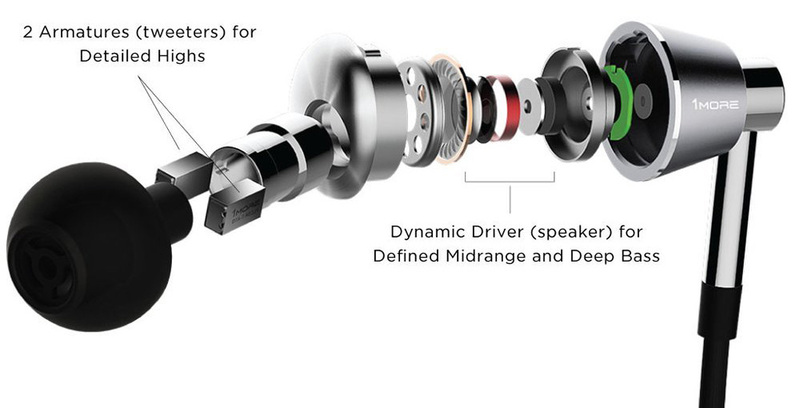 By separating mids, highs and bass, as decent audio loudspeakers do, you ought to hear more. That's the theory, anyway. 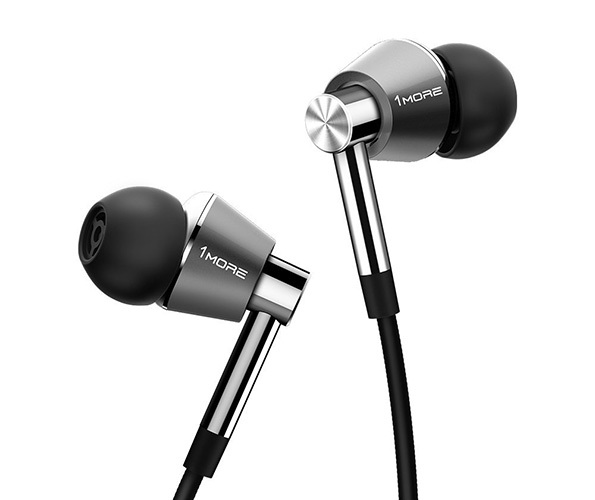 1More has collaborated with Grammy-winning sound engineer Luca Bignardi in tuning the profile of the buds, and the company says that both the Triple and Quad Driver models are the first in the industry to have THX certification. Using a Huawei Mate 9 as the source, firing up Dark Age by Midival Punditz is a good test of an earbud's range and depth. The 1More Triple Drivers deliver a full, wide soundstage, a little on the warm side, but with good contrast between full lows and the treble-rich vocals. There is little evidence of a muddying soundstage common on cheaper buds. Detail is rich, if not absolutely outstanding, though I imagine you would have to pay considerably more for an extra one or two per cent detail. The steady build-up in rhythm and urgency of Anoushka Shankar's Mahadeva is delivered in clear, concise fashion. Bass junkies may feel disappointed by the lack of blow-your-ears-out heft. That's not the point here; it's to provide an accurate reproduction, which the buds do. Switching gears, Rag'n'Bone Man's Skin is also done well, though there is a slight loss of composure as volume is jacked up to maximum. Still, it's an enjoyable aural experience that's accurate albeit a touch warm. I come away with the feeling that 1More is definitely on the right track, if you excuse the pun, with the comfortable Triple Driver in-ear buds. Well-built for the most part, especially the buds themselves, the trio of drivers combines to produce an accurate and wide soundstage that's in a different aural league than budget buds. Bass is controlled rather than gratuitously overbearing, mids and highs are decent at all but maximum volume, and the slightly warm sound is pleasant for extended listening. Whilst the sound quality is subjectively very good, I'd prefer the volume control to be a few inches further down and the upper rubber wires to be braided the whole way up. That's about it for the list of gripes. 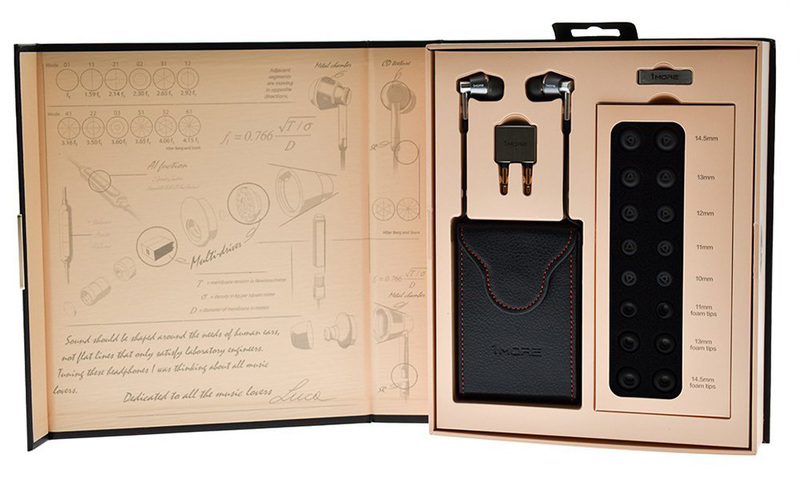 1More, a newcomer on the European scene, makes a strong case for consideration in the premium end of the earbud market. 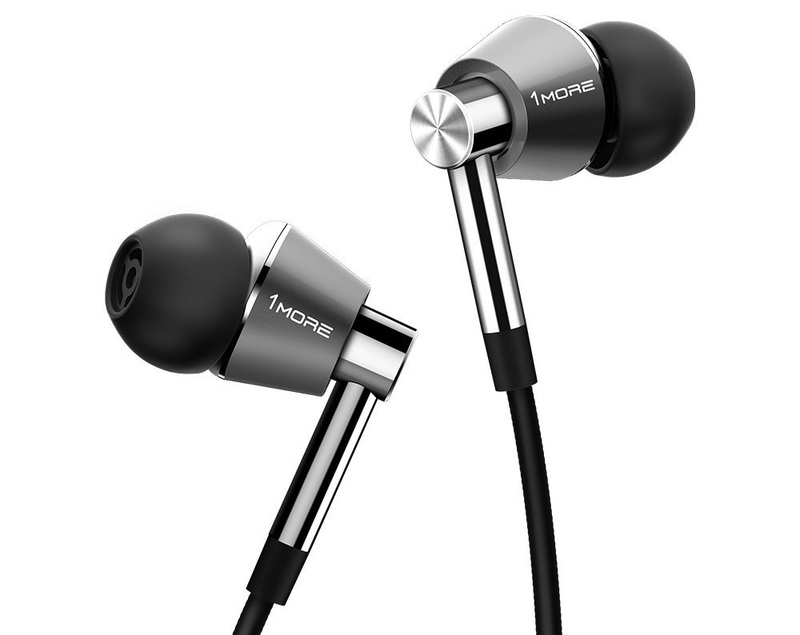 The 1More Triple Driver earbuds are available from Scan.co.uk. I challenge them, HEXUS guys, grab a pair of KZ ZST :) £14 delivered. I dare you not to be impressed. wonder what the frequency response is ?